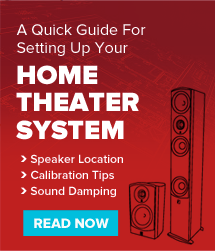 Aperion Audio Blog – Tagged "small room home theater"
Room acoustics are an often overlooked factor and should not sit low on your list of priorities. The impact on the sound quality can be immense and it’s not always clear how to handle the situation. Most of us have dreams of building the ultimate man-cave but the reality is that a majority of us simply don’t have the option to do so. So whether it be a home theater, music listening room, or gaming area there’s always a way to maximize your return on investment.